You are an archaeologist working the dig sites of the Egyptian desert. Search for the right pieces to complete torn parchments, broken pots, and other priceless artifacts. Trade shrewdly at the marketplace to increase the value of your collection. Sell your treasures to the museum for maximum profit. 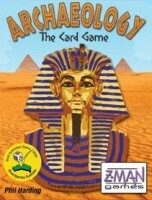 Archaeology-The Card Game by Phil Harding and published by Z Man Games is a light, quick game for two to four players. It works well with all player counts, is easy to learn, and is a bargain at $10-$12. Setup is easy, and the game plays in about 20 minutes. Kids as young as eight or so should be able to grasp the concepts of Archaeology in no time. The game is exceptionally portable with its roughly 5″x 4″x 3/4” box. The components consist of 87 cards and a rule booklet. Setup begins by separating Artifact cards from the Map, Sandstorm, and Thief cards. Then five Artifact cards are placed face up to create the “market” and stacks of three, five, and seven Artifact cards are placed around a reference card in a thematic “pyramid” shape. Next each player receives four cards as a starting hand. Finally, the Map, Sandstorm, and Thief cards are shuffled into the remaining Artifact cards. 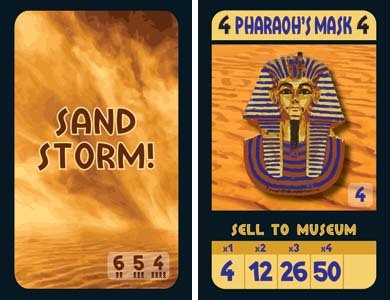 The resulting deck becomes the “dig site”, and the game is ready to play. Play begins with the first player taking one card from the dig site and placing it into his hand. He may chose to trade any number of cards in his hand with those in the market. Cards are traded at a 1:1 value ratio, and the trade value is clearly marked on each card. A player may also choose to take a set of matched cards and “sell (them) to the museum”. This means the player places the cards to be sold in front of him. But, a player cannot add cards to or take cards from a set that has been sold. They are now his to score at game’s end, and they cannot be lost or stolen. The values of a given set of matched cards increases exponentially as the number of cards in the set increases. But there are events which can cause a player to lose one or more of the cards in his hand. The Sandstorm cards cause each player to drop half the cards (rounded down) from their hand. And the Thief card allows the player who drew it to take one card from one of his opponents. The presence of Sandstorm and Thief cards make it risky to try and collect a large set of cards. The press your luck nature these cards create adds tension and excitement to the game. Even with the Thief cards, the game is not confrontational in nature. The player who draws the Thief has to blindly pick from his opponent’s hand, so he cannot target a specific highly valued card. The third and last non Artifact card is the Map. When a player draws a Map card, he may keep it, trade it in the market, or use it to take one of the three stacks of cards that comprise the pyramid. With one, two, or three Map cards, a player may claim the three, five, or seven card stacks. Map cards are rare, but using them to grab a few extra cards can be a game changer. Play continues until the dig site deck is exhausted. Then players make their final trades, and sell their cards to the museum. The player with the greatest number of points is the winner. Archaeology-The Card Game is a relaxing filler in a compact package. It would make a fine family game, yet it plays well with two. It shares some elements of Jaipur and Rummy, but it is distinctive enough to consider adding to one’s collection. Add a Review for "Archaeology – The Card Game"